When we think about aquaculture we tend to think of fish farming, and in particular, farming fish for protein. Chances are the fish you are eating today was farmed, not caught. Yet aquaculture – the production of living aquatic resources for food and materials – is a diverse sector. Many types of creatures have been domesticated and there are many modes of making money in a sector whose value chain encompasses smallholder farmers up through multinational companies that trade in global commodities. Regardless of the size of the operation, sustainable aquaculture, by definition, must be economically and environmentally sound. It must also be scalable in a way that ensures continued growth. Additionally, in regions where aquaculture and fisheries have played a culturally significant role for a long time, such as in the tropics, it must also be culturally appropriate. Fundamentally, there is no cookie cutter approach to aquaculture. This is mirrored by the diversity of living resources to choose from, including fish, shrimp, oysters, crabs, sea cucumbers, and seaweed. Of all these, the seaweed industry is perhaps the most promising space for innovation, and is probably also the most enigmatic for western societies to come to grips with. From Tanzania to India to Indonesia – soon to be the largest producer of seaweed in the world – seaweed farming has been embraced by many and diverse peoples. Seaweed is a great platform to discuss sustainable development in the Indian Ocean. Take the industry in Indonesia, for example. 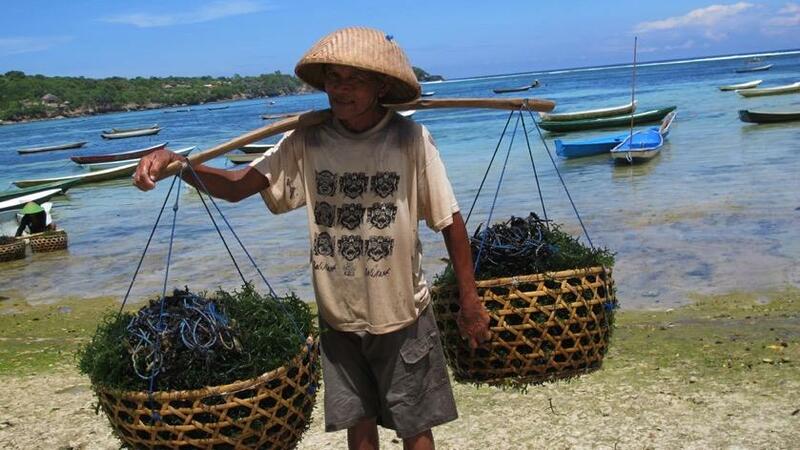 After 30 years, seaweed farming is now a fundamental part of the livelihood of close to 200,000 smallholder farmers and is still rapidly increasing across the archipelago. The previous 15 years have seen incredible growth, with seaweed now accounting for more than half of the aquaculture commodities produced in the country. Seaweed farmers are doing well. A sales price of $1,000/ tonne keeps farming families above the poverty line. It is also increasingly a focus of efforts by NGOs and international development as the start up costs are low. But some fear that the industry has already had its easy wins and the nuances of dealing with a global commodity market are bearing down. How does an individual, an industry, or a country for that matter, pivot from being a price taker to a price maker? The government of Indonesia has a vision: to process more seaweed domestically; create new products; and capture more of the value chain. This is a great start for sustainable development. The next step is to recognise the indirect value of aquaculture for ocean health. Can we pin the ocean health challenges to sustainable development? In Australia we pride ourselves as custodians of the environment. Australia is in many ways well placed to innovate in global environmental challenges: we have world-leading expertise in environmental sciences and ecological applications; we understand the links between environment and economy; and we have experience in managing blue resources – such as the Great Barrier Reef – and the complex interactions between land-use and ocean health (see government effort around the release of nitrogen and phosphorus). One aspect that Australia has been blind to is that aquaculture has ocean health benefits too. In other economies, aquaculture of filter-feeding molluscs are recognised as living resources with value to water quality. Scandinavia values the role of mussels in cleaning the environment and the United States values the role of oyster reefs in treating urban estuaries. But our views seem to be changing as we become more connected with our neighbours in Southeast Asia. We are increasingly comfortable with integrating the concepts of ocean health, technology, and commercialisation. Some futurist concepts are arguably “mainstream” now, such as the idea of using seaweed to draw down carbon from the atmosphere. The scale is a challenge but the premise is founded on the ability of seaweeds to treat the water and create valuable products at the same time. Seaweed with fish at a weekend market. Green and gold seaweed with crab and sea cucumber. 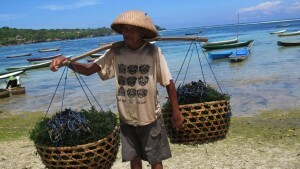 Seaweed farmer in Bali-Nusa Lembongan, Indonesia. Seaweed donuts on sale in Indonesia. 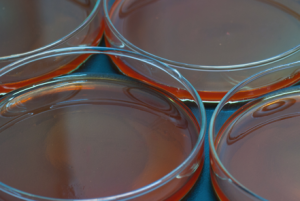 Laboratory agar, made from red seaweed. More than half the world’s population lives within 150 km of the sea. The pressure on our coasts is substantial and mounting. This is also a time when the traditional cost of treating waste is so prohibitive for emerging economies, such as Indonesia, that more than 80% of the waste is discharged untreated. The oceans are all inter-connected, so the benefits at one point can flow on to another. Enhancing ocean health then takes on a shared meaning even if there is a discrete regional effort. It’s time to explore the mix of products and services that can create more effective businesses in the blue economy – ideas that may not have made sense in the past but now do, because of changing commercial, social, and environmental issues. Seaweed-based products and services could enable us to adapt to the pressing issues of our time regarding ocean health, human health, nutrition and the global environment. Seaweed is renowned for its health applications and is now pushing the boundary further in creating new products. We have a worldwide shortage in agar (the gel extracted from some seaweeds used in medical applications) and there are clear health benefits from seaweed fibre and minerals, which act to reverse diet-induced syndromes. 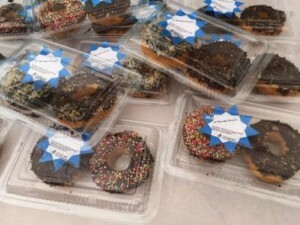 The best part is that we may be able to hide the seaweed ingredients in other foods – healthy donuts anyone? This all gets more interesting when the act of growing the seaweed takes on new meaning and value. 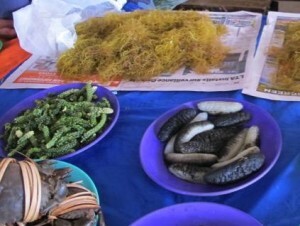 One example is the push to showcase the seaweed industry to tourists in Indonesia. Visitors can meet farmers and tour the farm sites, increasing awareness of the industry and demonstrating its compatibility with other uses. A final thought for the sustainable development goals – financial support for ecosystem services. This area is a work-in-progress. But consider this: there are now green bonds to conserve forests, but what about blue bonds for the ocean? There is a strong environmental and social logic for the preservation of important marine environments, such as mangroves and sea grasses, just as there is for the preservation of rainforests. Can we go further than preservation and move towards reversing the problem? 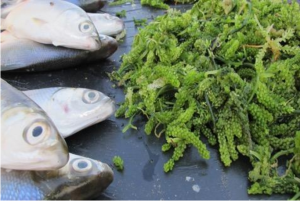 I put this to colleagues in the finance sector – how do we go about recognising the economic value of supporting and growing the seaweed sector? How do we then incentivise the farmers and the communities to produce living resources that extract waste from the coastal waters? Who will be the early movers in this space? A financial product for ecosystem services could be the disruption that takes sustainable development to the next level. Dr Nicholas Paul is a project leader with the Australian Centre for International Agricultural Research (ACIAR), a statutory authority within the Foreign Affairs and Trade portfolio of the Australian Government. His work with the Fisheries program of ACIAR focuses on the aquatic farming and processing of seaweeds in Southeast Asia and the Pacific islands. Great article and great insights to present seaweed industry and innovation opportunity for Australia. The first move will be for the government to develop a vision and policy with both scientific community and industry’s support. Without that, it is a great challenge to be successful in scale as Indonesia did in 30 years. In addition, Australia can only embark on this industry successfully, baed on our innovation in seaweed aquculture, advanced clean processing, and high value-added products.